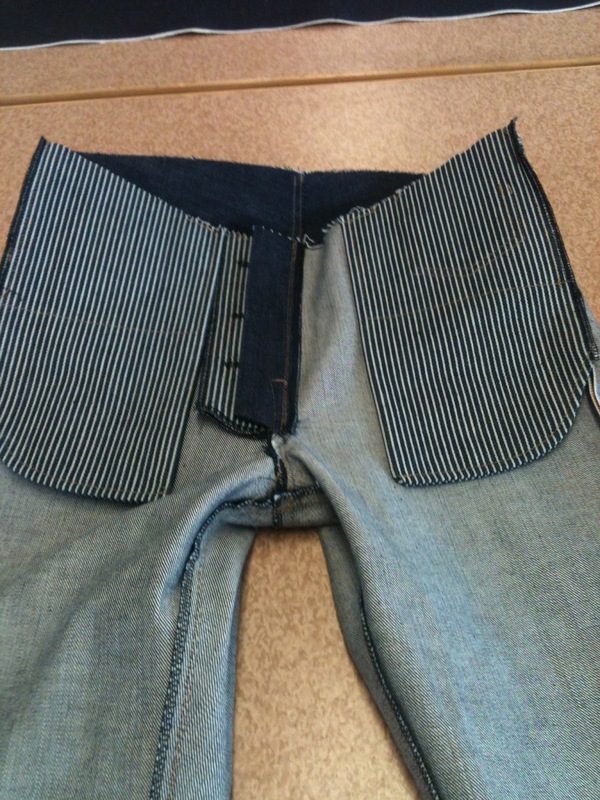 As promised earlier I would post the finishing of the Jeans today, and here it is. To create the fly you take you're fly piece and mark out the button holes, then you attach the fly piece on to the left front piece. I wanted the back piece of the fly to have the same fabric as the pocket linings so I did a small change in the pattern. 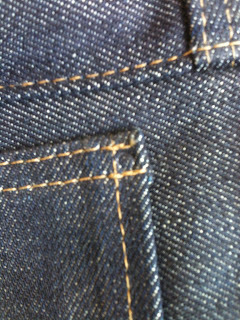 Then to hold the fly piece on it's place you do the fly stitch, and here you can chose to do it as a single stitch or a double. 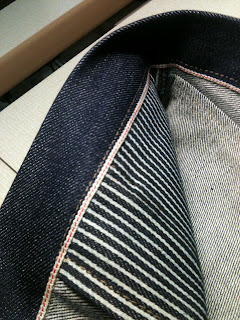 For this pair I chose double. 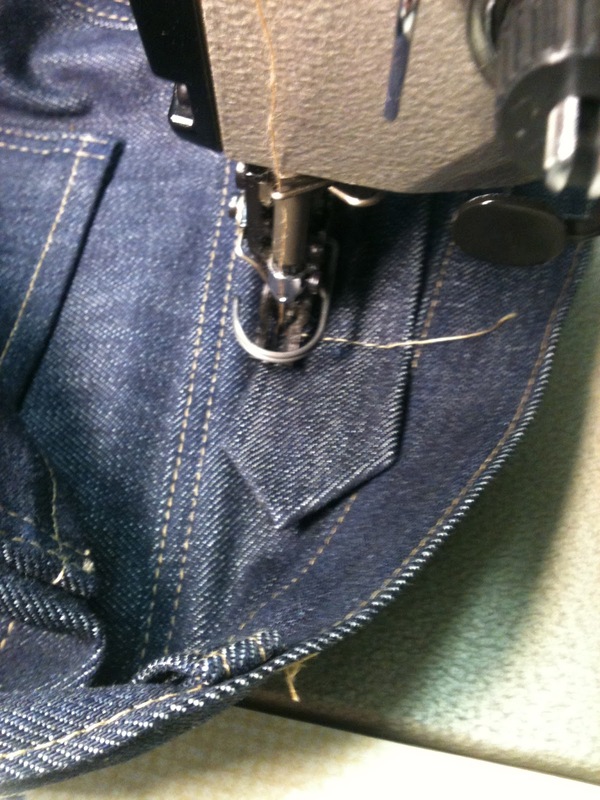 Here I'm placing the piece where the buttons will be attached, I made it 1cm shorter than I've done before and that just because I want my waistband to be a little shorter. 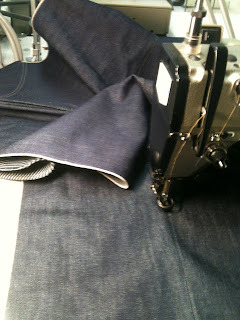 And now when the both front pieces are done, I put them two together. With the back piece and front piece almost done it's time to put them together. 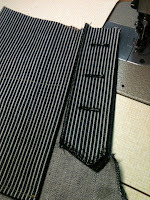 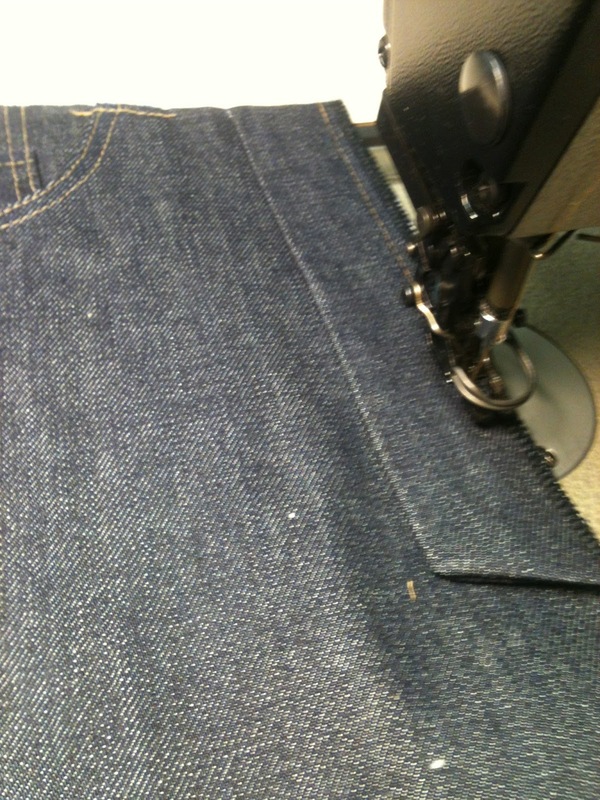 I start with the inner leg seam from the inside out. To make it a little bit easier I start from the crouch and go down to the hem, this is just so that I have full control over the front and the back crouch seam so that they will get parallel with each other. 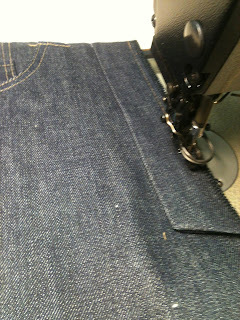 Then I flip it over to the right side and do the inner leg stitch. 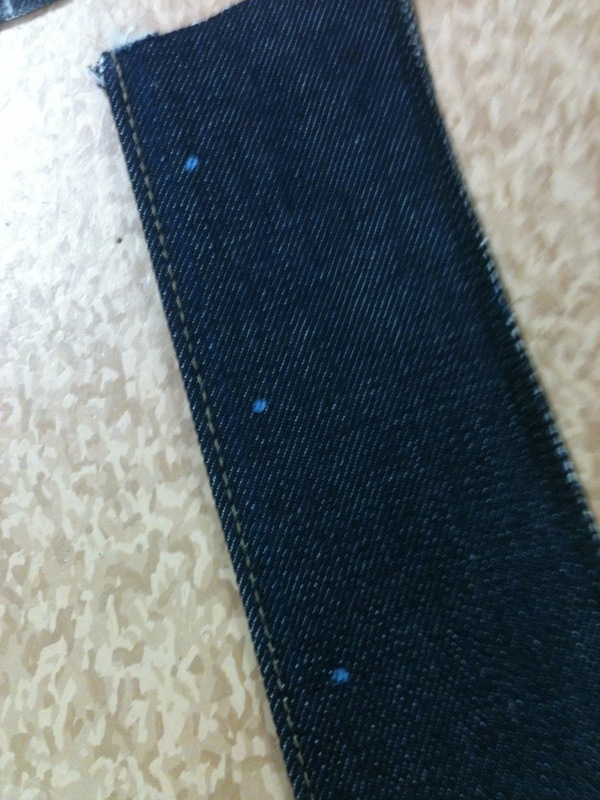 It's a fairly long stitch. 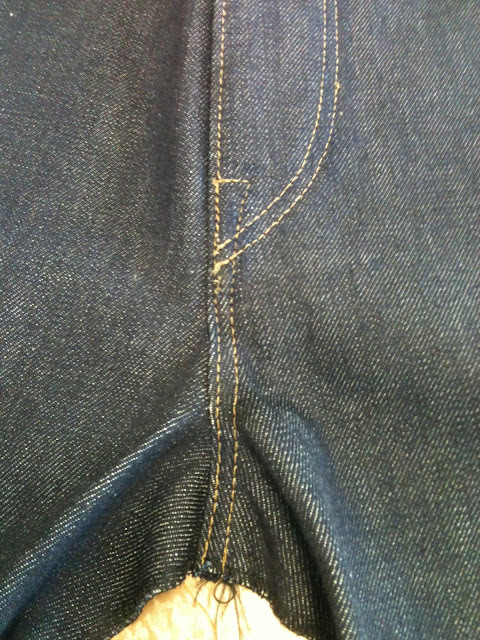 Turn it inside out again and close the legs. 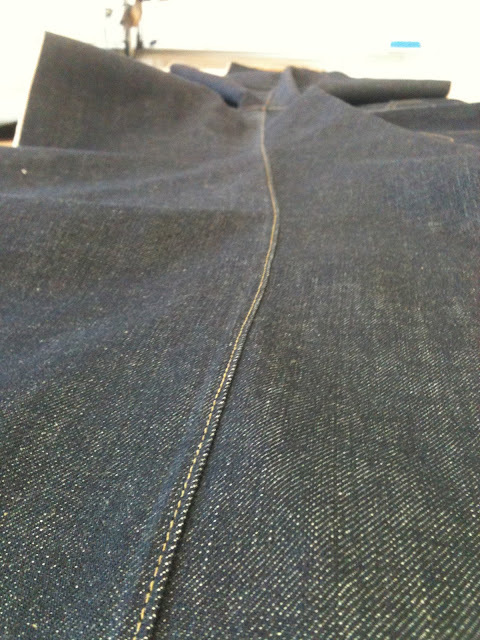 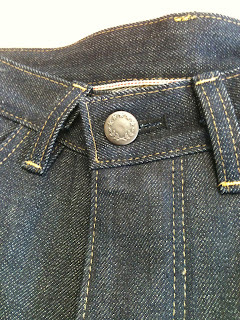 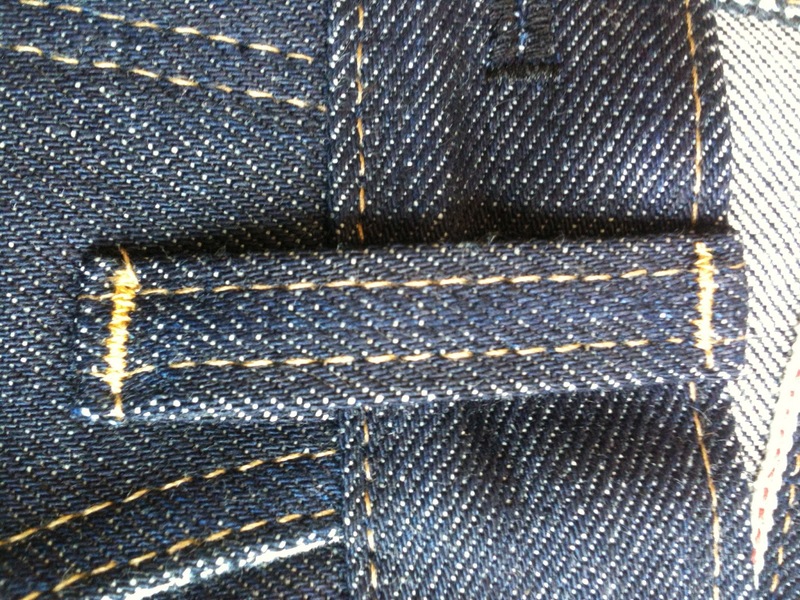 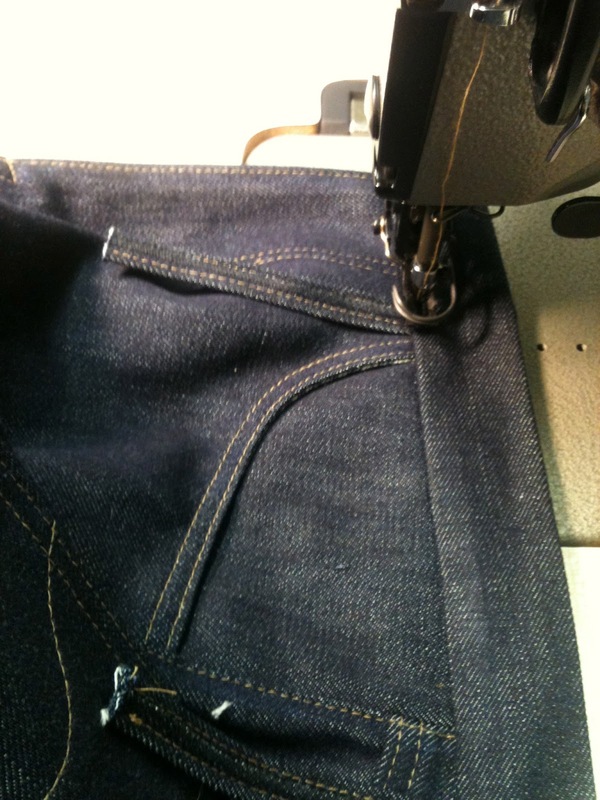 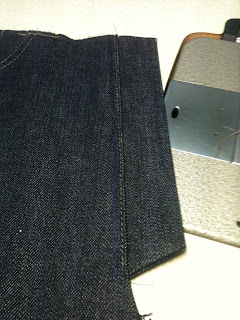 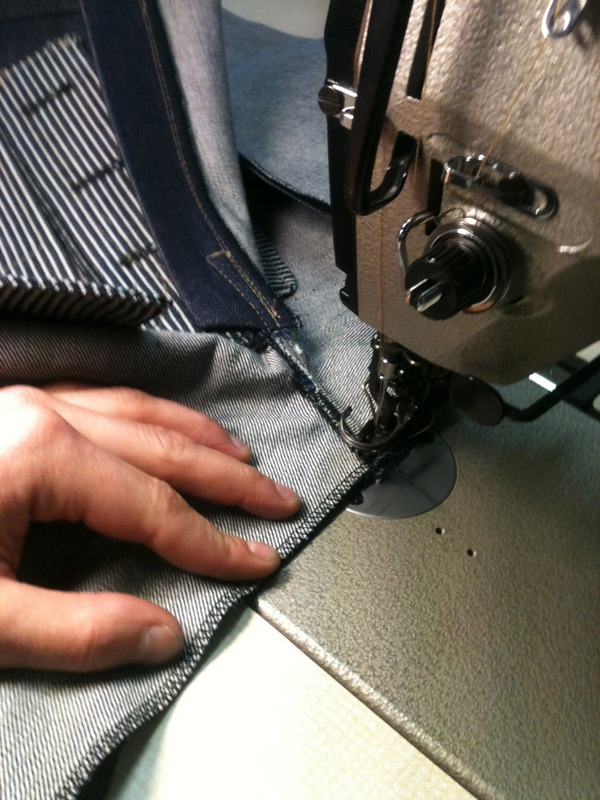 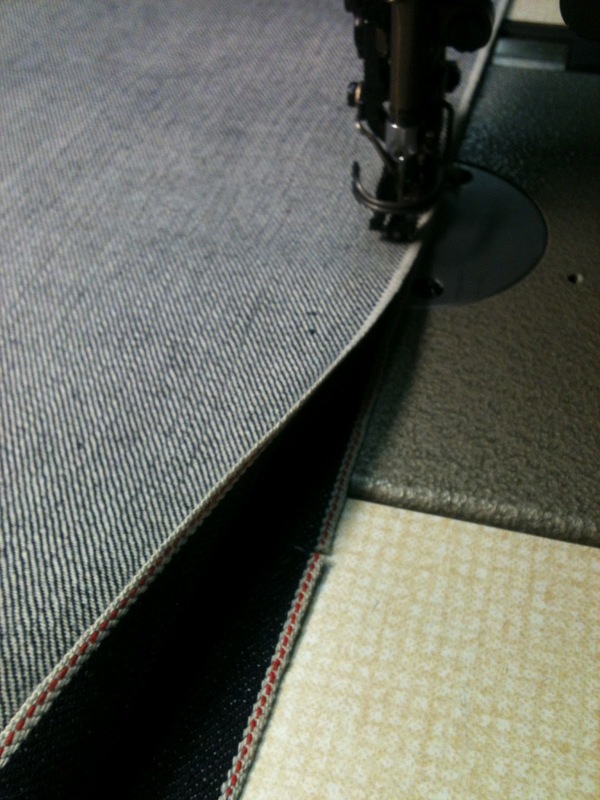 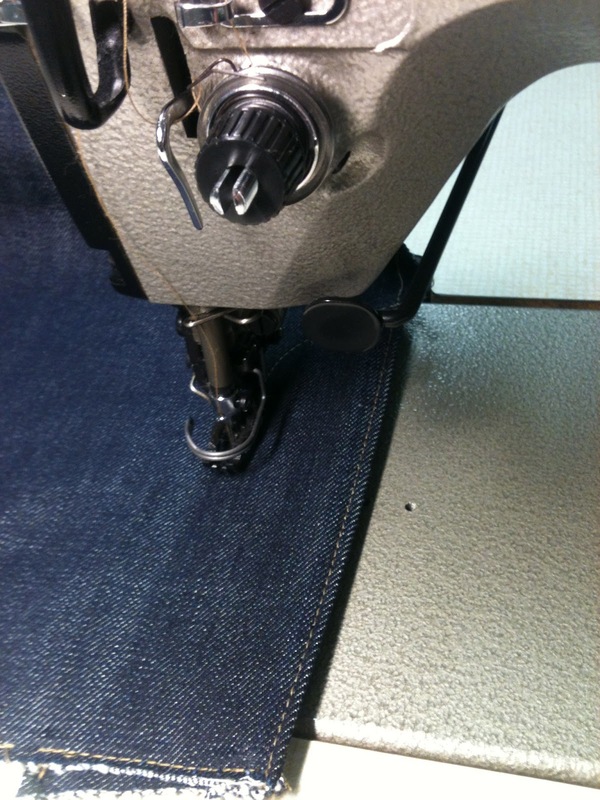 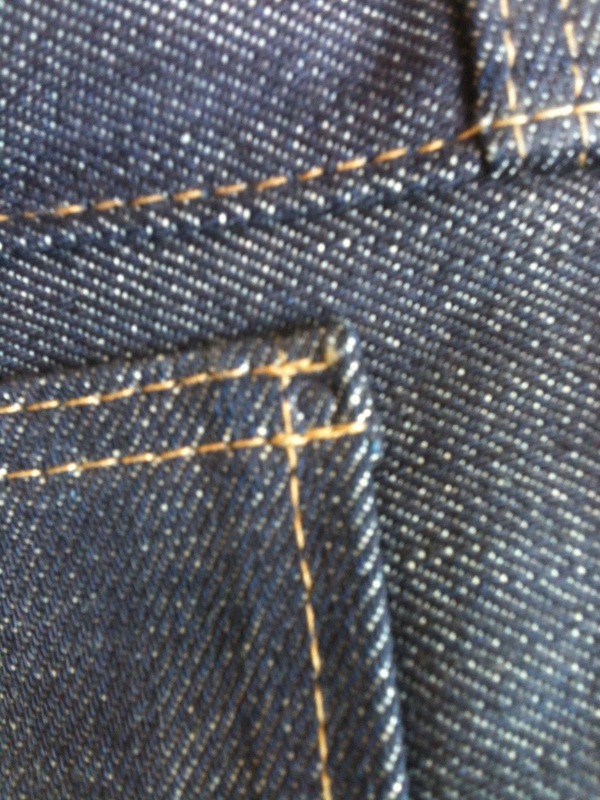 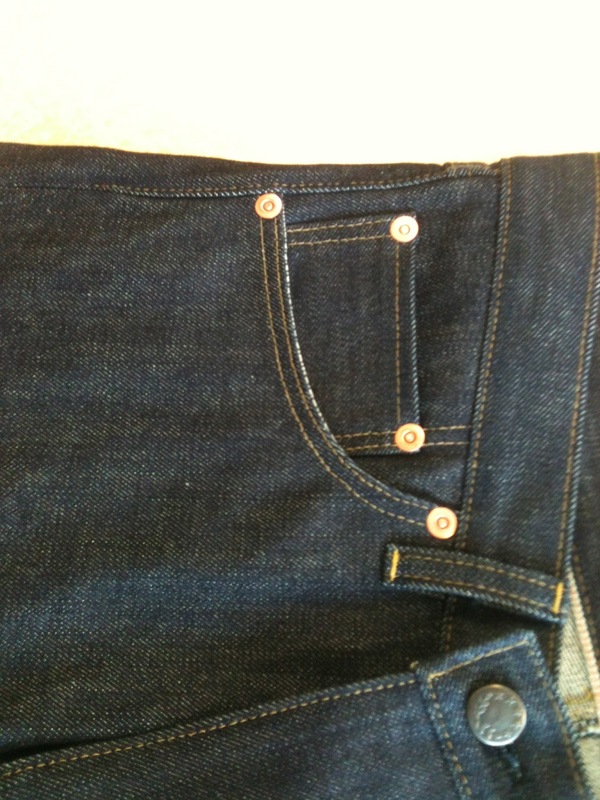 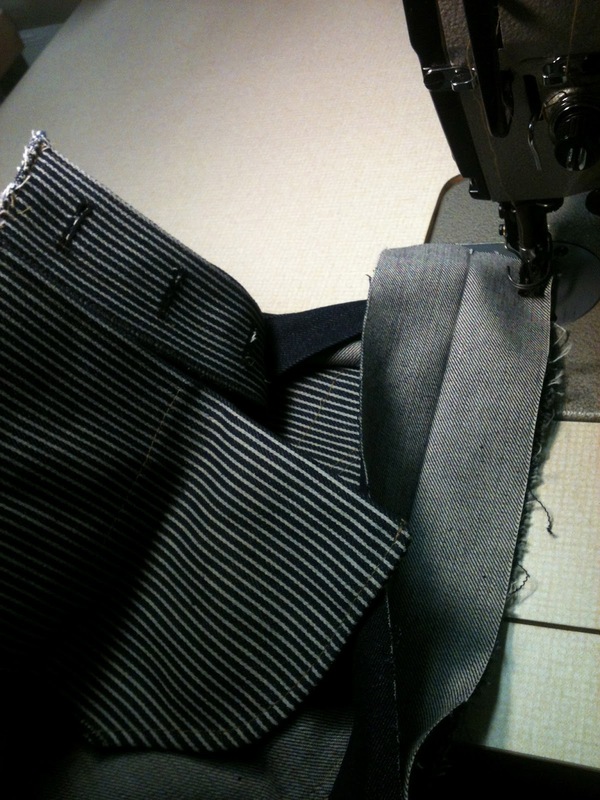 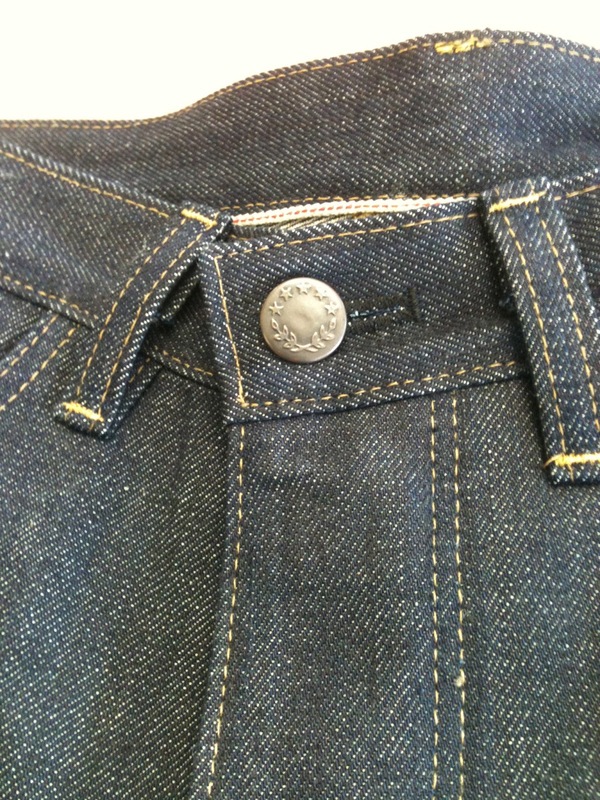 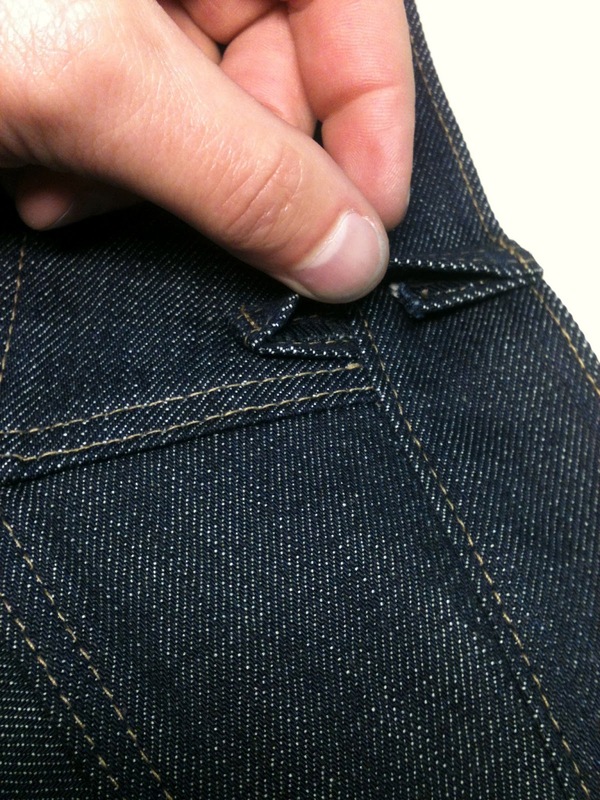 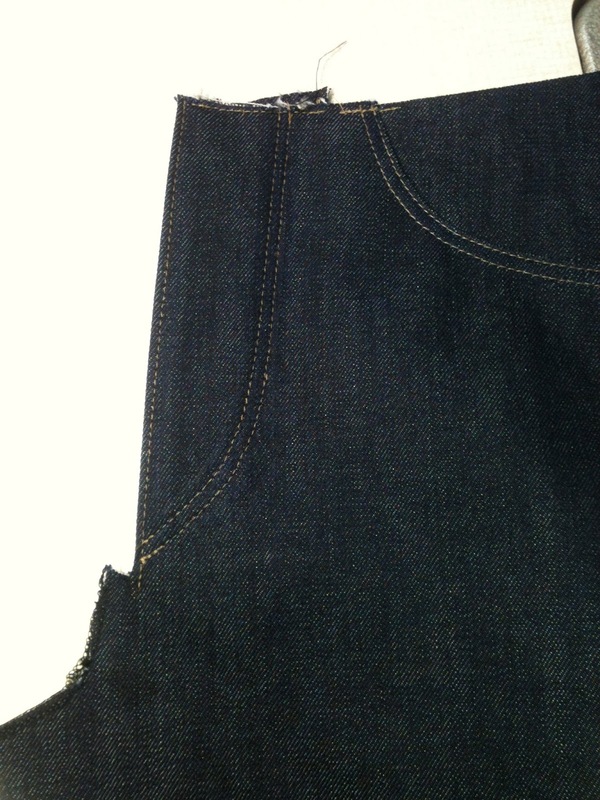 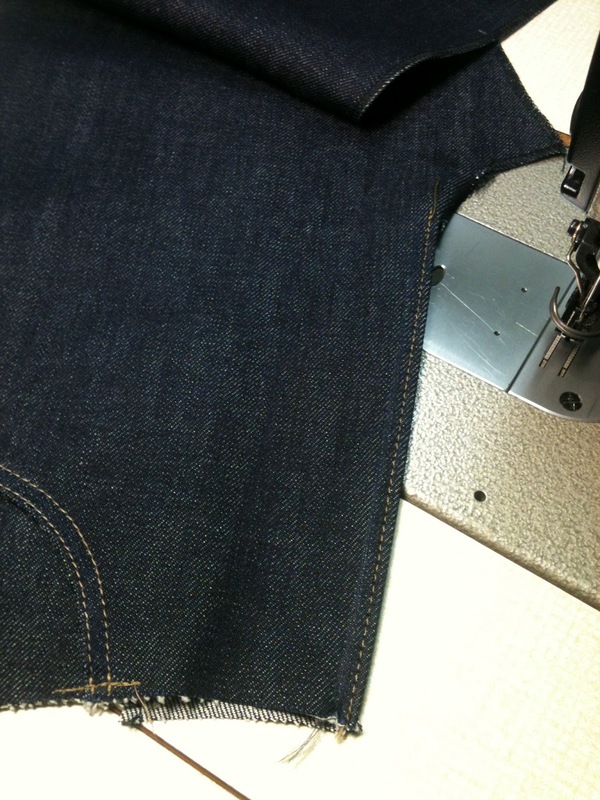 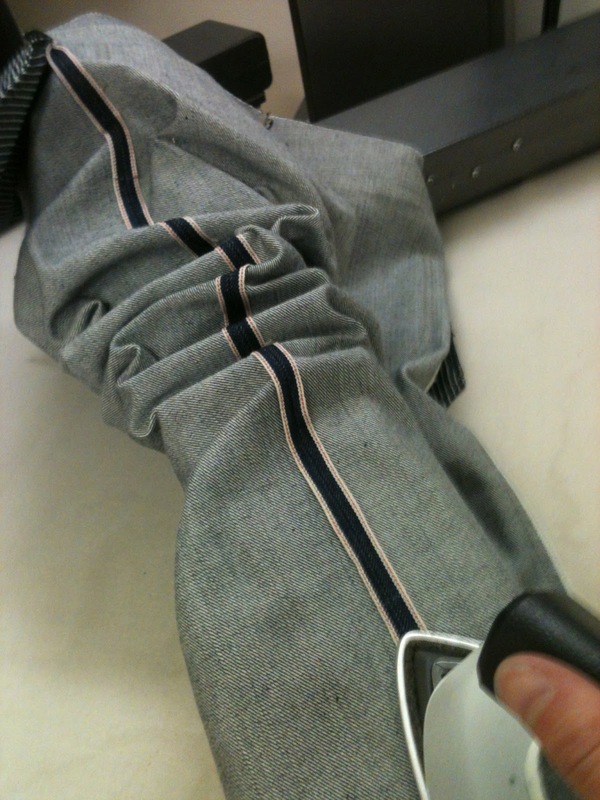 Iron the selvedge and do a stitch to reenforce the edge of the pocket lining. 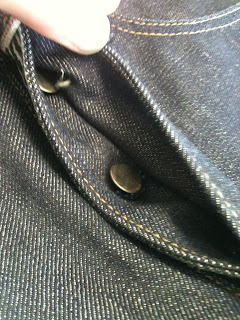 I want my belt loops to be more sustainable therefore I attach them under the waistband. And now It's time for the waistband. I do one seam and then flip it over. Then I reenforce it with a stitch all the way around and this stitch will also attach the inside of the waistband. 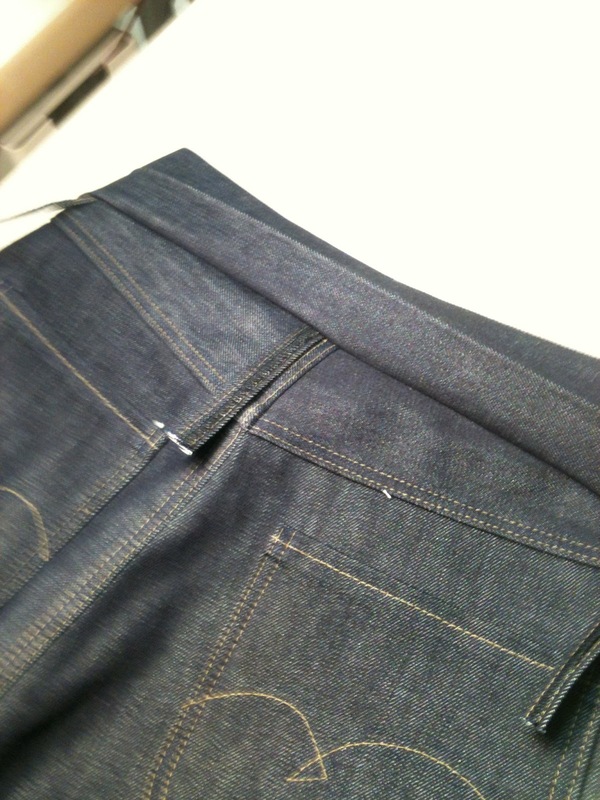 A little esthetic stitch and then attach the belt loops on to the waistband, and here you can see how the waistband reenforce the belt loops. 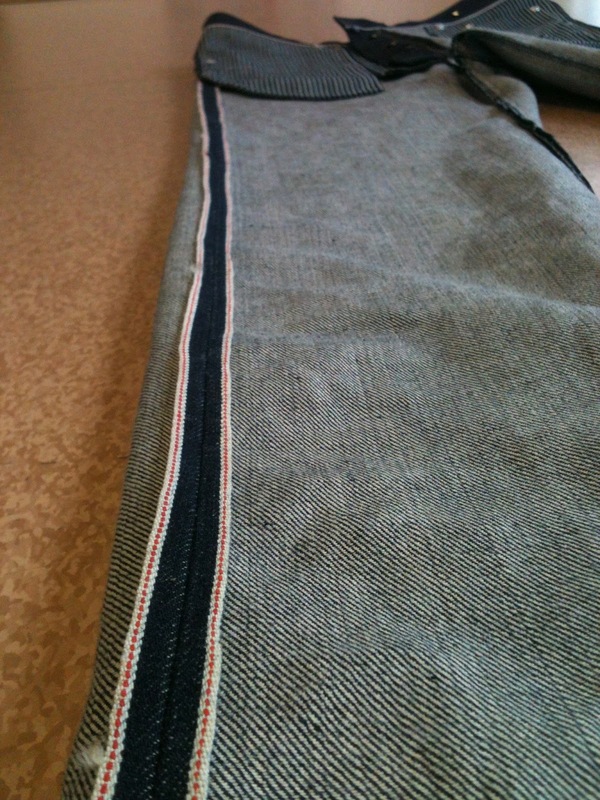 A cinch soon on it's place. I waited until I attached the waistband so that I could put the cinch on to the waistband. 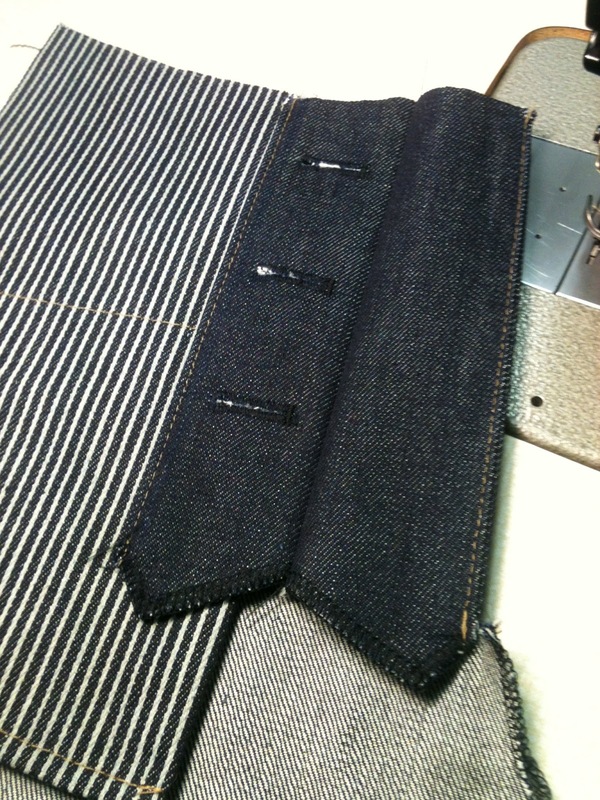 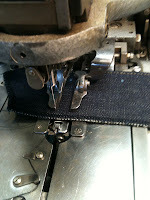 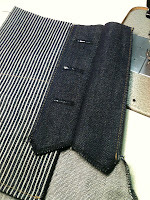 Bar tacking the belt loops, back pockets, cinch and crouch to strengthen the areas that get's a lot of stress. 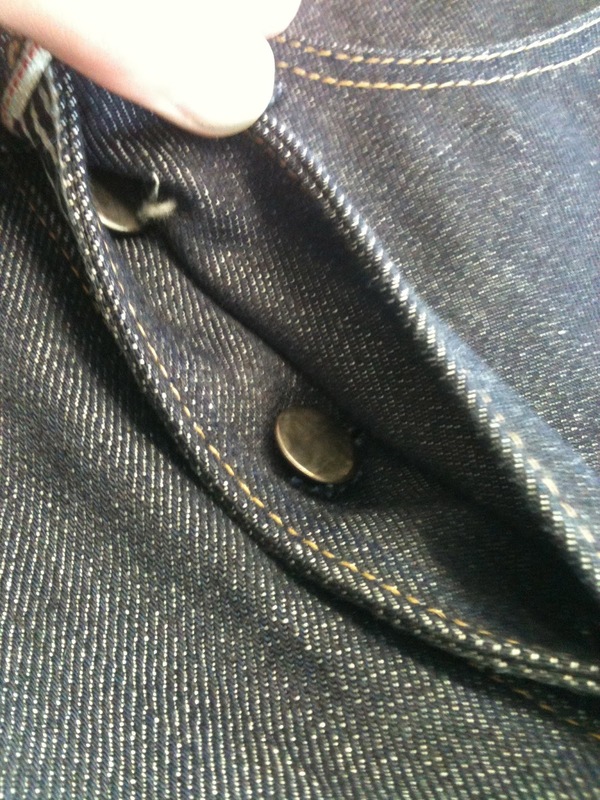 Don't know if you can se it, but in the corner of the watch pocket there's a round mark, and its from the rivet. 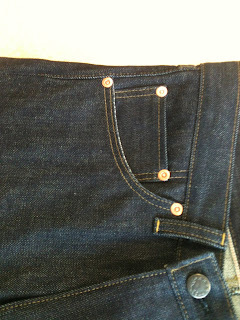 I placed the rivet head on the spot where I wanted it and then put some pressure on it, just so that I got the right accuracy for the rivet hole. 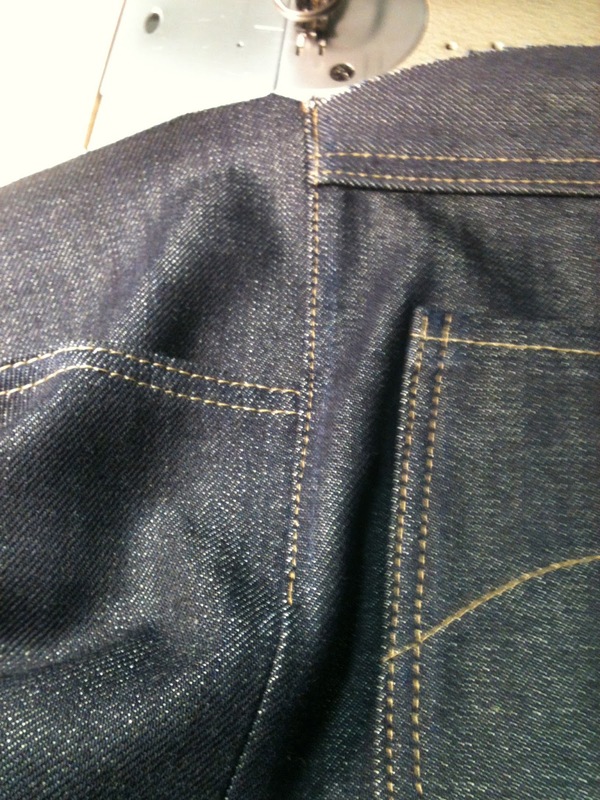 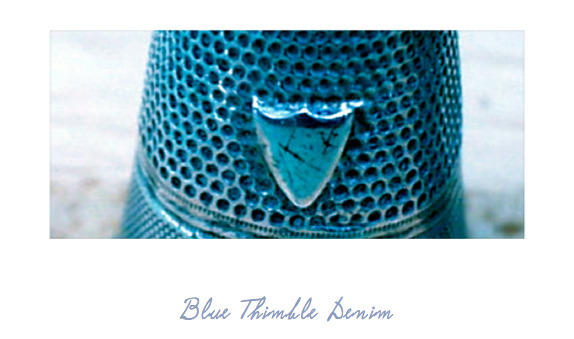 I have also gotten the opportunity to post articles of this pair of jeans in Denimhunters Lifestyle Magazine. 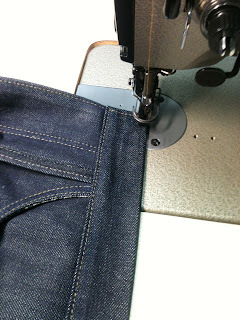 There I'm going to go a little deeper in to how to make a pair of jeans. 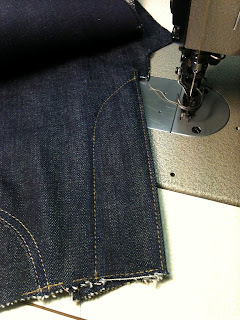 The part of making you're own pattern is already up and you can read all about it HERE.